Beta Mu alumni, many with spouses, gathered to mark Pike’s 150th Founders Day with a March 1 Houston reception and a similar event on March 29 in Dallas. Each event welcomed more than 50 alumni brothers and spouses. In Houston, Jim “Mattress Mack” McIngvale ’70 was presented with Beta Mu’s new Spirit of Generosity Award, recognizing his love and service to the people of the City of Houston. Congressman Brian Babin ’68 joined in presenting the award to McIngvale. Dallas alums gathered for a lively evening and saw the new house plans and received a campaign update on the Texas Pike Centennial Chapter House. The campaign has reached $4.1 million of its $5 million campaign goal. 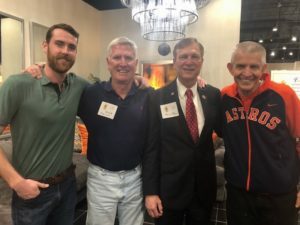 (l-r) Matt Phelan ’09, Beta Mu Chapter Advisor Doug Phelan ’65, Congressman Brian Babin ’68 and Mack McIngvale ‘70 enjoyed the Houston Beta Mu 150 Founders Days. 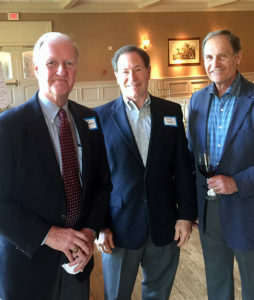 (l-r) 1970s initiates Ed Cartwright, David Cordell and Steve Ray reunited at the Dallas 150 Founders Day. 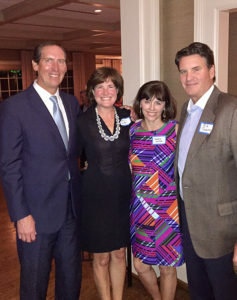 (l-r) Sally and George Dutter ’83 and Kathryn and Rick Jackson ’84 at the Dallas Beta Mu 150 Founders Day.